Outreach and community service programs are an integral part of Physical Sciences and its departments. Our dedicated faculty and students take time out of their research activities to run and teach the programs below. These programs connect K–12 students and the local community with a greater understanding of scientific discovery through our researchers’ expertise, and encourage future Bruins to pursue careers in the sciences, mathematics, and teaching. 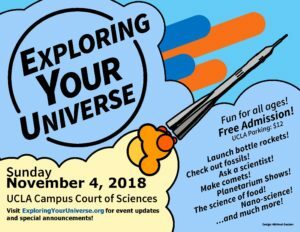 Exploring Your Universe (EYU) was first presented in 2009 when graduate students from UCLA’s departments of Physics and Astronomy and Earth and Space Sciences decided to offer a free day of science fun to folks of all ages from all over the Los Angeles community. 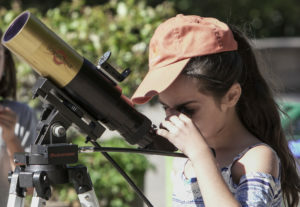 While EYU began as a celebration of the International Year of Astronomy, it quickly expanded to offer talks and hands-on activities covering a wide variety of scientific subjects, from chemistry to nanotechnology to Newton’s laws to dinosaurs. To accomplish this, many students, faculty, and staff from across UCLA sign up to offer activities and talks during Exploring Your Universe. We believe there is something for everyone at EYU and invite you to join us each November for this free event for the whole family. Click here to read more about this event – including our Science and Education Pioneer Award recipients, astronaut Anna Fisher and actress and author Danica McKellar. Astronomy Live! 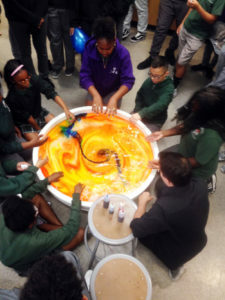 : Graduate students from the Department of Physics & Astronomy take fun, interactive demos to K-12 schools in the Los Angeles are throughout the academic year. The presentations are free for applicants, but there is high demand, so it is recommended that you contact the student group as far in advance as possible. Click here to read more and apply on behalf of your school. California NanoSystems Institute Workshops for Teachers: The CNSI Nanoscience Teachers Workshop invites K-12 science teachers from across the greater Los Angeles area to our CNSI facilities one Saturday each month throughout the academic year for workshops and complementary experimental kits. 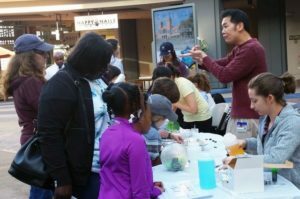 CNSI Nanoscience at the Mall: Nanoscience workshop demonstrations are taken to malls across Los Angeles to directly encourage the local community to explore nanoscience. 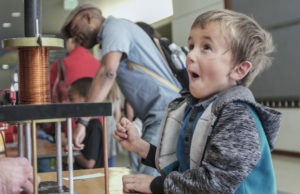 With the help of enthusiastic faculty, staff, graduate students, and post-doctoral scholars, different malls are visited throughout the year with hosted kiosks exhibiting novel nanoscience phenomena in a way that is easily accessible to people of all ages. Curtis Center for Mathematics & Teaching: The Philip C. Curtis Jr. Center for Mathematics and Teaching is dedicated to researching and developing K-16 mathematics programs for students, teachers, and future teachers. DIYnamics: Providing assembly instructions, lesson plans, and instructional videos that enable students and teachers – from elementary to college-level – to experiment with Earth science concepts by doing their very own geophysical fluid dynamics, the physics of fluid motions on Earth and other planets. School visits with demos led by the team of UCLA students and scientists are also available. 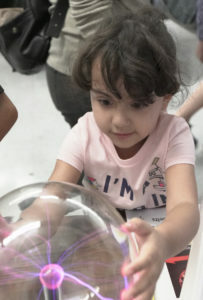 Earth, Planetary, and Space Sciences: The UCLA Physical Sciences’ department of Earth, Planetary, and Space Sciences offers a variety of science outreach opportunities, from school visits to tours of EPSS-related activities on campus, for school children of all ages. Los Angeles Math Circle: This top-tier math circle is free and open to elementary, middle and high school students interested in mathematics and eager to learn. A program of the Department of Mathematics at UCLA, the Math Circle focuses on showcasing the beauty of mathematics and its applications, improving problem solving skills, preparing students for a variety of contests and competitions, creating a social context for mathematically inclined students as well as attracting students to math-related careers. Los Angeles Physics Teachers Alliance Group: A unique, hands-on opportunity open to any high school student interested in learning about experimental physics. Since its founding in 1993, more than 20 high schools, several community colleges, and two universities (UCLA and USC) have partnered on experiments. 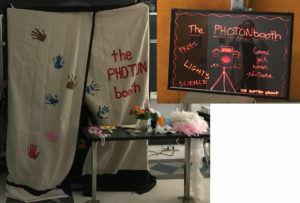 The PHOTONbooth: A fun twist on a photo booth, the PHOTONbooth provides an avenue for kids to experience fluorescence first hand. The booth is coupled with demonstrations of household fluorescent materials and the creation of highlighter glowsticks. The booth is available for visits to schools and community events. UCLA California Teach: Encouraging UCLA students who are studying math, science, and engineering to consider teaching math and science by offering guided exploration of teaching as a career, and additional support and pathways for those who decide that teaching is for them. UCLA Mathematics Project: UCLAMP is part of a statewide program that strives to make a positive impact on math teachers and their students. The project’s goal is to enhance the skill sets of K-12 math teachers who can in turn increase their students’ ability to succeed. Based on twenty-five years of experience, UCLAMP has developed a program that is helping to make significant differences in the quality of teaching in urban schools. UCLA Planetarium: Free, public shows for all ages are presented every Wednesday evening (check the website for cancelations or special circumstances). Telescope viewings follow the planetarium shows on these evenings. UCLA Science Lab Teaching Club: Headquartered within the UCLA Department of Physics and Astronomy, the club was founded to help compensate the loss of the science teaching faculty at local public schools due to severe budget cuts; provide teaching experience for the undergraduate students majoring in physics and astronomy; and to spark interest in science in the next generation. Club members take lessons and demos to area schools when requested. UCLA Science Project: Designing and implementing programs that identify, develop, and promote strategies that make good science instruction available and accessible to all students. Undergraduate Research Center – Sciences: Serving students and faculty in all areas of life and physical sciences, engineering and mathematics. Its primary mission is to promote, develop and celebrate undergraduate student research with the overall goal of enhancing undergraduate education and preparing students, including those from disadvantaged backgrounds, for academic and research careers. If you would like a scientist to visit your school or community program, please contact Lisa Garibay at lygaribay@ucla.edu or 310-825-1040. 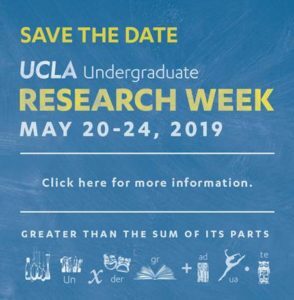 If you are within a UCLA Physical Sciences department and have a new outreach activity to promote, please call or email Lisa at 310-825-1040 or lygaribay@ucla.edu.